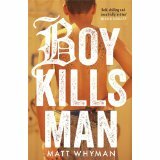 Matt is a bestselling author who has written widely for all ages across a range of subjects in fiction, advice and memoir. Co-writing with Michelle Misra, under the pen name of Jack Carson, Matt is responsible for the Battle Champions action series for younger readers (Simon & Schuster). Matt is married with four children and lives in West Sussex, England. Find Matt on Twitter @MattWhyman and at www.mattwhyman.com. 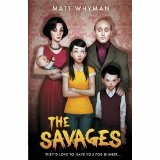 The Savages: What happens when the teenage daughter from a family with extreme tastes in meat-eating starts dating an outspoken vegetarian? Sasha is smitten by Jack, and wishes her parents would approve. For Titus and Angelica, it’s one more challenge in creating a stable home for their brood. While angelic baby Katya is set to cut her teeth, their son struggles at school. Ivan does his best to be accepted, but that’s tough when he’s been secretly raised to become the ultimate hunter gatherer. 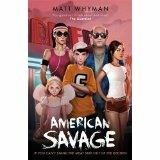 Welcome to the world of The Savages – a breed apart from your average household, here’s a darkly delicious treat for anyone who s ever been embarrassed by their own flesh and blood.